As a dry-skinned gal, I didn't think I needed to set my look with powder until I began to notice the foundation on my nose would disappear after just a few hours of wear. It would happen even though I was using a long-wear formula and my face hadn't oiled up much! I've learned to apply a bit of setting powder after since then, and it has honestly made a difference in how much longer my makeup lasts! If you're a newbie at this like I am, it's good to know that there are great budget options available. But what if you want to invest in something that's HG quality? Well, that's where the rest of the PV team chimed in! Sam: I finally found the perfect product that mattifies, smoothens, and sets my makeup! The Banila Co. Prime Primer Finish Powder (what is that name though) is a finely milled product that minimizes my pores, smooths out texture and actually provides oil control. It sets my under-eye area and very oily T-zone very well, AND minimizes (and in some days eliminates) the dreaded eyeglass marks on my nose without any caking or white cast! I bought the travel version for touch-ups but I find that I hardly need any for normal circumstances (ie, not spending the day under extreme heat). I thought I'd never find something like this but I'm so happy, it actually eliminated my fear of powder! Kim: Despite being an oily gal, I'd have to 'fess up that I'm not the biggest fan of powders. I live for dewy, healthy-looking skin and mattifying powders just feel flat to me! So I'm really happy I got into the cult favorite Laura Mercier Translucent Setting Powder. This gives me a smooth, silky base without killing my glow! It doesn't help much in way of controlling oil but I find that it makes my face base stay a little longer. Marielle: I've given up on loose powders at the moment. They're too messy for me, so my Laura Mercier ended up in storage for the time being. My tamad self is all about the Shiseido Baby Powder. I even use the included puff! It doesn't alter the color of my foundation (unless an excessive amount is used), and I like the velvet matte finish. Crystal: Oily girl here! I consider myself to be a powder fiend so it's hard to choose just one. The OG Laura Mercier Setting Powder in Translucent is always on people's HG list for a reason. It really does put the "T" in "translucent" while still setting my makeup well! Oil control is so-so, though, so I boost it with primers and setting sprays. 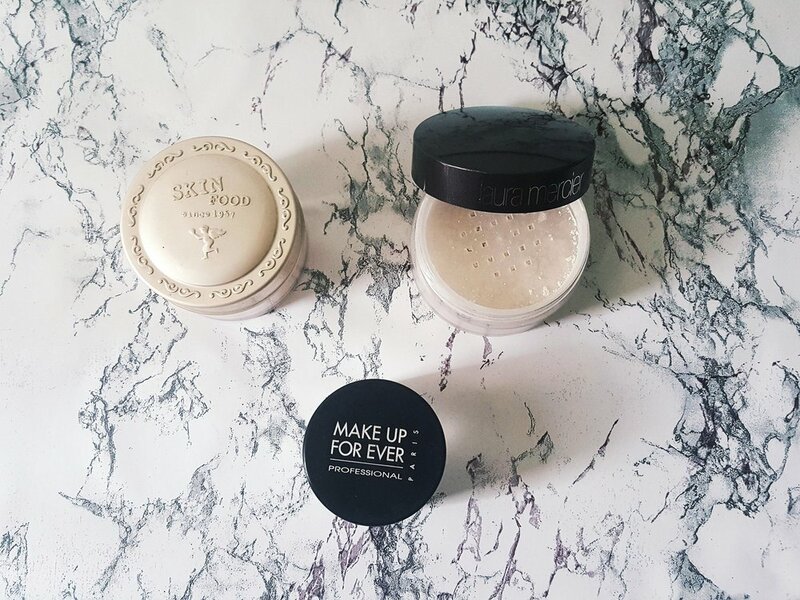 I also love Make Up For Ever HD Finishing Powder for its pore-blurring capabilities and very good oil control. For daily use, I'm currently loving Skinfood Buckwheat Powder. I adore the affordable price and decent oil control, plus it never cakes no matter how much I pile on. I will still have to retouch no matter what, though. My skin is just that oily! Claire: My first ever setting powder love was the Innisfree No-Sebum Mineral Powder. It has awesome oil control powers! I stopped retouching my makeup at work, and blotting papers became the only thing I needed to keep my makeup intact. When I finished the tub, though, it was out of stock everywhere so I tried another K-beauty fave: Skinfood Peach Sake Silky Finish Powder. I was not let down! Oil control isn't as good as my first love but the delicious scent makes up for it. It also made my skin feel much smoother. My most sulit setting powder buy is the RCMA No Color Powder, though. Wayne Goss made me buy it! A no-nonsense powder, it does the job well with no fuss or frills. My concealer stays put ALL day. Nina: My fave is Laura Mercier’s Translucent Setting Powder! Need I say more? It sets my foundation and concealer like a dream, providing a creaseless, smooth face, and doesn’t cause a white cast on my skin! The powder also prolongs the wear time of my base, which means that I never really have the need to touch up whenever I am out. Convinced to try setting powders yet? You can actually start with baby powder formulas, including a talc-free option. Finally, if you're torn about which powder to get, we've put some of them to the test to see which one would be best at prolonging wear and reducing shine. And if you hate a powdery, overly-matte finish as I do, this hack of applying setting powder BEFORE foundation may also be your jam! Found your perfect setting powder yet? Would love to hear about your picks in the comments below!